Disclaimer: The information on this page is intended for individuals who have been medically diagnosed with knee tendonitis. If you suspect that you have tendonitis in the knee then it is important to visit a qualified medical professional in order to rule out any other possible causes prior to considering any advice or treatment option. Is pain from knee tendonitis stopping you from enjoying sports, exercise or keeping active in general? ;Has knee tendonitis begun to interfere with your work, sleep or lifestyle? Backed by a ‘No questions asked Money Back Guarantee’? If you are afflicted by knee pain from tendonitis then it is most likely you answered yes and if that is the case then using the OSMO Patch in combination with adequate rest may be the most important decision that you will make towards becoming pain free from knee tendonitis and taking back control of your health TODAY! The OSMO Patch is able to naturally reduce the swelling and pain associated with knee tendonitis, however first let’s begin by getting a better understanding of this inflammatory knee condition, such as what is knee tendonitis and what are the causes and signs of tendonitis in the knee. What is a knee tendonitis? Knee tendonitis, also known as patellar tendonitis as it refers to the swelling and inflammation of the patellar tendon, normally involves the upper part of the patellar tendon which attaches to the patella (kneecap). Patellar tendonitis is different to patellar tendinopathy. Patellar tendonitis refers only to the inflammation of the tendon whereas patellar tendinopathy is the condition that results from repeated strain, causing micro-tears in the tendon as well as collagen degeneration and can often be the cause of considerable knee pain. Patellar tendinopathy is sometimes referred to as “Jumper’s Knee”. Causes of knee tendonitis (patellar tendonitis)? Although any person may develop patellar tendonitis it is more often seen in active people that participate in physical activities such as, soccer, track and field, basketball, tennis, and football for example. The most frequent cause of knee tendonitis includes; sporting injuries, sudden impact injuries, repetitive work related stress injuries as well as wear and tear from aging. Generally patellar tendonitis is classified as an overuse injury. What are the signs & symptoms of knee tendonitis? Pain at the front of the knee. Pain when kneeling or squatting. Pain walking up or down stairs. Pain when running or jumping. Usually an ultra-sound or MRI will be used to properly diagnose patellar tendonitis and rule out that the pain is actually coming from the knee cap (Patella) itself. In the first 24-48 hrs any signs or indications of patellar tendonitis can be treated by rest and icing of the knee. The purpose of this is to hopefully lessen the amount of inflammation and swelling to the patellar tendon. Patellar tendinitis treatment is generally a long process and recovery may take a few weeks or even months. Your doctor will normally recommend anti-inflammatory medications and may even suggest a cortisone injection if pain is severe. Having already tried these medications with little to no benefit. These medications might not be suitable due to age or a pre-existing medical condition. Cortisone injections are generally painful & seen as invasive by many people. Alternatively, some individuals may just prefer to utilise natural treatments when dealing with their knee pain. 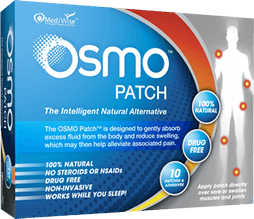 The OSMO Patch now offers an Intelligent 100% Natural Alternative or complementary addition to anti-inflammatory medication and painful cortisone injections! The OSMO Patch has been especially designed to draw fluid from the body and reduce the swelling and associated pain in conditions such as knee tendonitis. In fact the OSMO Patch when used properly in combination with sufficient rest of the knee is the ideal choice to support the recovery of knee tendonitis. Best of all the OSMO Patch is easy to use; simply apply the OSMO Patch just under the knee cap or over any area of inflammation or pain just prior to going to sleep. The OSMO Patch will then go to work removing fluid and stimulating blood flow continuously through the night while you sleep. When you awake just remove the used patch and discard. Backed by our No Questions Asked Money Back Guarantee. So if you are ready for a natural & effective approach to supporting the relief of inflammation and pain caused by knee tendonitis then the OSMO Patch is the Answer!